Glenfiddich Vintage Reserve presents this exeptionnal Single Malt, selected for its aromas and unbeatable quality. Glenfiddich Vintage Reserve presents this exeptionnal Single Malt, selected for its aromas and unbeatable quality. This Single Malt was distilled on october the 3rd in 1972, it has been aging for 31 years in oak casks with remarquable flavors, n°16037. It has been bottled on april 21st 2004 and pictures among the 270 limited edition bottles. 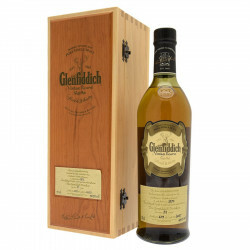 Every single casks of the Glenfiddich reserve is absolutly unique. This emeraud gold Single Malt offers a rare quality chocolate flavor, reminding Champagne toasts. A chocolate bite grows on light truffle flavors, frosty lemon and jasmine tea. An exceptionnal tasting with a perfectly organized finish.